Listening to oral arguments is generally frustrating for me. Case in point: On Oct. 6, the Wisconsin Supreme Court heard oral arguments in May v. May, No. 2010AP177 (filed Jan. 6). In May, the parties stipulated that Michael would pay a minimum amount of child support for 33 months and could not seek a reduction during that time period. Seventeen months later, he lost his job and sought relief. The trial court found that the stipulation was not against public policy and denied his motion. Michael appealed. The Court of Appeals in its certification noted a conflict between a footnote in Frisch v. Henrichs, 2007 WI 102, ¶74, n.23, 304 Wis. 2d 1, 736 N.W. 2d 85, in which the Supreme Court appears to allow a floor in child support as long as it is only for a limited period of time and the Court of Appeals’ decision in Jalovec v. Jalovec, 2007 WI App 206, 305 Wis. 2d 467, 739 N.W.2d 834, which held that a stipulation setting a four-year floor on child support violates public policy. What causes my frustrating as an observer is that occasionally a lawyer, or even a justice, misstates the law. In this case, a justice, hopefully, simply misspoke when saying there is a two-year prohibition on changing custody and placement. (In case that justice is reading this, it’s a higher burden for two years, not a prohibition). In addition, sometimes it seems the questioning by the court and the responses by the lawyers miss the real issues. In this case, the continual actions by Michael over the years to reduce child support, while no doubt important to Ms. May, should not be the basis for establishing public policy in Wisconsin. Rather, the public policy issue present in May is the freedom of parties to contract. The closest analogy is not custody and placement statutes, but maintenance. 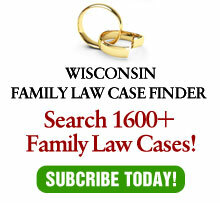 Wisconsin courts have long recognized that spousal support may be paid in a non-modifiable fashion instead of statutory maintenance, which is subject to modification. If the parties agree to waive maintenance and have support paid in a contractual fashion, they will be held to their agreement. Ross v. Ross, 149 Wis. 2d 713, 439 N.W.2d 639 (Ct. App. 1989). Even a stipulation providing for maintenance will be non-modifiable if that was the intent of the parties. Nichols v. Nichols, 162 Wis. 2d 96, 469 N.W.2d 619 (1991). Although I disagree with it, there is at least a valid argument that stipulations placing a ceiling on child support should not be enforceable since the children would be surrendering a higher standard of income without their consent. Why, however, would that argument prevail when the stipulation provides for a floor, which is designed to protect the childrens’ standard of living? The freedom to contract support is important as it allows parties to make decisions without fear of court intervention. People frequently make vocational choices based on factors other than money. They may go into a preferable field, leave a horrible boss (hopefully, not as in the movie), make a vocational choice to spend more time with their children or for myriad other reasons. Where support is modifiable, these decisions must be made with one eye – and sometimes both – on the unknown vagaries of what a court might think. If support is contractual, both parties know the extent of their financial obligations and can plan accordingly. If child support floors are enforceable, this does not lead a payor in financial straits to debtor’s prison. Just as with Section 71 payments, a remedial contempt action requires a court to find that the alleged contemnor has the ability to obey the order. See Gregg Herman, “The Law of Contempt” 30 W.J..F.L. 2 (Spring, 2010). As I’ve argued before, the best interests of children would be promoted by discouraging litigation between parents. As long as their basic needs are met, children would be better served with fewer financial resources and a peaceful environment, rather than more money and less peace. If you don’t believe me, just ask a child whose parents are warring.